At this year’s IDF Intel announced its third major microarchitecture family: Quark. Before Quark we had Core at the high-end and Atom for smartphones/tablets/cheap PCs. Quark adds a third vector, below Atom, with a focus on even lower power, more cost sensitive markets (e.g. low power embedded). Intel finds itself in an interesting position today. When it first launched Atom, x86 compatibility was a selling point - something no competing ARM solution at the time could offer. These days the bulk of the mobile world is built on ARM code. Similarly, because of ARM’s excellent portfolio of super cheap, low power cores, there are many other markets where ARM is just as prevalent. Add onto that some of the lowest cost platforms to develop on and do neat things with run ARM based silicon, and not x86. In other words, there’s an entirely new generation of platforms, developers and applications that aren’t x86 compatible. Over the long run this poses a big problem to Intel. While x86 might not be an advantage in a lot of high growth markets, it’s still an advantage in many others. Any erosion of that advantage simply puts Intel in a much more difficult position in the long run. The solution, albeit a bit late, is Quark. The design is 32-bit Pentium ISA compatible (Intel apparently loves starting out new projects with the Pentium ISA), and features a core that should be roughly 1/5 the size of Atom and capable of operating at as little as 1/10 the power. Quark's other major selling point is it is a fully synthesized design. It'll be built exclusively at Intel fabs to start (the first chips are built at 32nm), but Intel made it very clear that if you want a cheap, low power x86 core to integrate alongside your own IP, it'll offer you Quark. Previously Intel provided no such solution, which drove some customers to ARM. You could even speculate on what this means for Intel's strategy as being even more of a player in the foundry space. 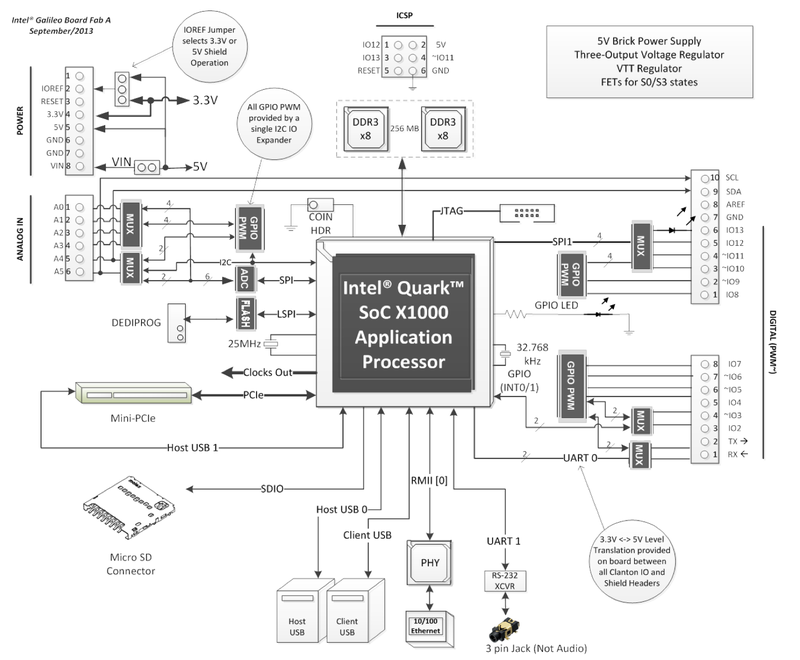 Today Intel is announcing a microcontroller board based on the Quark X1000 SoC called Galileo. The Quark implementation on the board is a single-core running at 400MHz (single speed, there’s no speedstep equivalent here). There’s a 16KB L1 cache and 512KB on-die embedded SRAM. 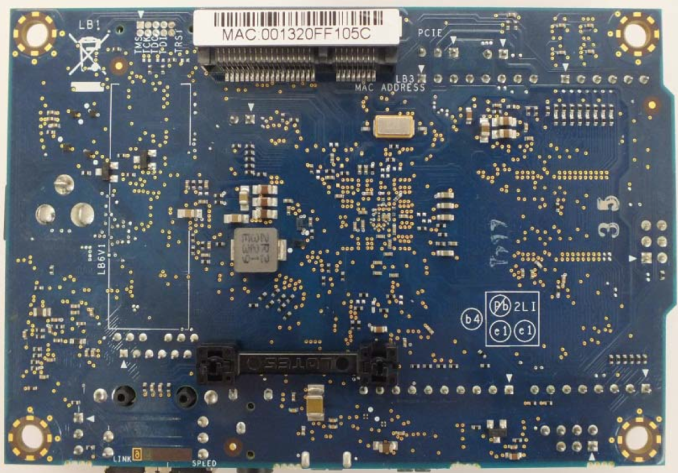 The board features a 10/100 Ethernet, mini-PCIe slot (PCIe gen 2 x1), USB 2 host controller, USB client connector, JTAG header and 256MB of DRAM. Galileo also features an 8MB SPI Flash for firmware/bootloader/sketch storage. MicroSD card support is optional. Galileo measures 4.2 inches long by 2.8 inches wide. The other big feature of Galileo is that it is compatible with Arduino software and shields, making it a great target for students and educators in the maker scene. It’s good to see Intel doing this sort of stuff, as it's extremely important to get early exposure to x86 among maker enthusiasts if Intel wants to keep x86 around in the long run (although I would’ve liked to have seen it a few years ago). 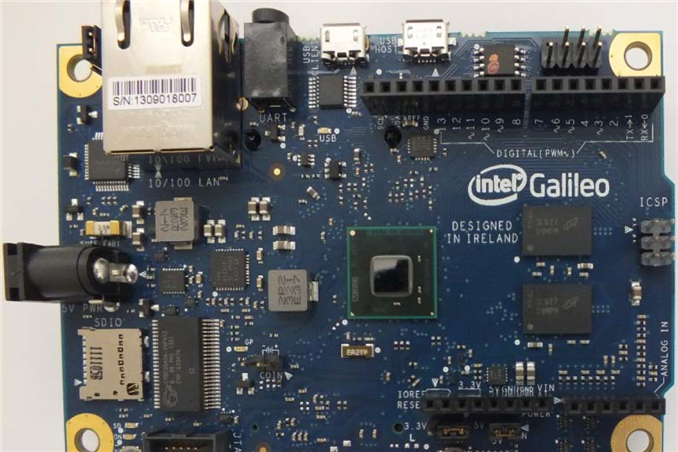 Intel will be giving away 50,000 Galileo boards to 1000 universities worldwide over the next year and a half or so to spark development. Boards will be available for sale by the end of November, at a price under $60. Yes. Cost is required. I've got some experience with Atmega based Arduino boards and making small and fun projects. The reason I ever got into all this was that I could pursue it like a hobby as it never weighed my pocket down. Comment about it being based on Pentium ISA is interesting - at IDF they weren't talking to us at all about the architecture.